The last two weeks of college football have not been pleasant to watch if you’re a Wyoming Cowboys fan. A loss to FCS North Dakota and a loss to perennial MAC bottom dweller Eastern Michigan, both at home, are not exactly how fans of the program envisioned this year starting. I’m not going to lie, I thought we’d be 2-0 right now myself. After not seeing the game vs North Dakota last week due to me spending excessive amounts of money and time in Seattle’s Public Market, and the game not being on TV, I only relied on the box score. It was bad.. really bad. New quarterback, two veteran running backs, a young but seasoned offensive line.. I thought we’d put up points. Then we didn’t. Against an FCS school. At home. That game was worse than the Cal Poly loss two years ago under Dave Christiansen’s watch, that game was played with a third string quarterback. North Dakota was played with a mostly healthy team expected to be in a bowl game this coming December. People were buying into the hype, people thought this would be step 2 in Craig Bohl’s rebuilding effort to bring the program to the top of the Mountain West. North Dakota was a setback, Eastern Michigan was supposed to be the rebound. Josh Allen started vs EMU due to an injury to Cameron Coffman. Josh Allen is a transfer from Reedley College in California. Making his first FCS start he looked like he’d be doing it for years. Good arm, good decisions running the read-option, gaining positive yardage and moving the ball down the field. This looked like a team who was ready to put North Dakota behind them and pound this MAC team into the turf at 7200 feet. EMU was ripe for the picking, they hadn’t won an out of conference road game since 1988. The first trip out west in years. A young team with a few playmakers. Nope. Josh Allen was marching the ball down the field with the game tied at 7-7 in the first quarter. Allen scampered off on a quarterback keeper and ran into a pile of defenders near the first down mark. Shoulder first he pushed the pile and picked up two more yards. Allen comes up lame. Down on one knee the trainers come out to look at him. He’s favoring his shoulder, maybe a collarbone. He goes off the field, onto the cart, and to the locker room. Cowboy drive stalls with a missed field goal. EMU marches down the field and that’s the last time they looked back on their way to beating the Cowboys mercilessly on their home field. One of the defensive players from EMU was carrying a giant pipe wrench on the sidelines as they danced on our turf, celebrating breaking their miserable record of out of conference losses on the road. The Cowboys fell to 0-2 on the season. It’s not time to pull the rip cord on the Cowboys football season yet. 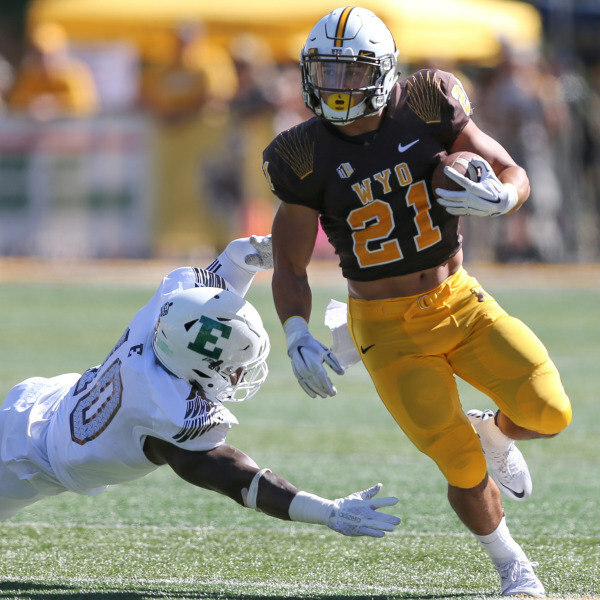 This Wyoming football team might be one of the youngest teams in all of FBS. There are nine seniors on this team. NINE. Of those nine seniors only five are starters. Behind that is 23 juniors. The rest of the team? Freshman, redshirt freshman, and sophomores. Five defensive starters are underclassmen, mostly in the secondary. Is it any wonder that this team has struggled to begin the season? This team is going to struggle with the number of young players seeing the field this early in their careers. Many freshman are not redshirting their first year in Laramie. There are still several bright spots on this team that should give fans hope that Craig Bohl’s system will work. The Cowboys ran for more than 400 yards against EMU, their highest rushing total since a game against San Diego State in 1988. Brian Hill accounted for 240+ of those yards, he’s a sophomore. Josh Allen looked terrific against EMU until he got hurt. He’s a sophomore and could very likely apply for a medical redshirt for this season if he doesn’t play again. That would give him two more years of eligibility after this season. Allen being in the game opened up the playbook so much more due to his mobility as a quarterback, something that Craig Bohl enjoyed at North Dakota State with Brock Jensen running the Bison offense. Another bright spot is Ethan Wood, the junior punter. He’s become a terrific weapon for the Cowboys when the offense sputters, or even on kickoffs when he boots it through the endzone. Some young guys in the defensive secondary are stepping up and becoming great tacklers such as Andrew Wingard, Chavez Pownell and Robert Priester. Right now the team doesn’t look like much, but they’re playing every down. This team isn’t hanging their heads. They’re too young and too naive to let a couple of losses drag them down. They know they’re young, they know they’re inexperienced, and they know that much brighter days are ahead if they stick together for the next 4-5 years under Craig Bohl. When Bohl rolled into town the cabinets were a little bare. There were a few playmakers left here such as Eddie Yarbrough, Dominic Rufran, Tanner Gentry and a handful of others, but really this team is literally being rebuilt from the bottom. Looking at the number of young guys on this team, sophomore and younger, this is a complete rebuilding effort. What can we expect for the rest of the season? My guess is a lot of frustration, a lot of growing pains, maybe a few wins. You’ll more than likely see a team learn how to start winning some of these games. You’ll see a team who will better overcome a little adversity. You will see a team that will become more “Cowboy tough.” You saw the Cowboys moving the ball up and down the field in the 3rd and 4th quarters today with the offensive line leaning on the defense and the Cowboys gashing the Eagles for long gains. That’s Bohl football, and EMU could do nothing to stop it. By the time the Cowboys started to gel together in this game the Eagles were already too far ahead. This team isn’t hanging their heads. This coaching staff isn’t hanging their heads. If they aren’t hanging their heads then the fans shouldn’t either. I’m not here to tell you what kind of fan you should be, I know I’m an irritable fan after my team loses (as evidenced by the beer drinking and swearing today) but these guys need time. They’re experiencing growing pains, but also experiencing small glimpses of success. Over time those small glimpses will become bigger and more sustained, and then we’ll have a winning football team. Until then, step away from your 3rd story deck, step away from the edge of the tallest building in your town, take your head out of your barbecue grill, and look both ways before you jump in front of a moving bus. Better days are coming and the brown and gold bandwagon will be overflowing. It’s a tough time, but this too shall pass. The injuries are a little frightening. Some guys trying to do too much by themselves in some cases. Give ’em hell Pokes! See you in Carolina! It’s never time to give up. Cowboys and their fans persevere through it all. Yeah, Bohl needs a little more time (although not seasons’ worth).